Halloween Morning on Thames RIver Harbor. Thomas Jefferson is on the left and a U.S. Coast Guard ship is on the right. history. New London is a mariners town and is home to a Naval submarine base as well as the United States Coast Guard Academy. New London was also home to the Eastern shores largest whaling industry in the 1700’s. After having a glimpse of New London (only 2.5 hours north of NYC) I returned to the Thomas Jefferson and watched as the ship readied herself to leave the dock and begin yet another survey (mapping the ocean floor) of the ocean floors. While I watched the deck hands, officers, and surveyors ready the ship I asked random shipmates who exactly worked aboard the Thomas Jefferson. Based on our conversation I was able to make the following chart. This chart breaks down the five basic groups that are aboard the Thomas Jefferson. The only person I did not account for is the amazing ET (Electronics Technician), Mike, who helps with all computer and system related problems (there are enough aboard to keep him busy 24/7. Dave cooking a tasty dinner. 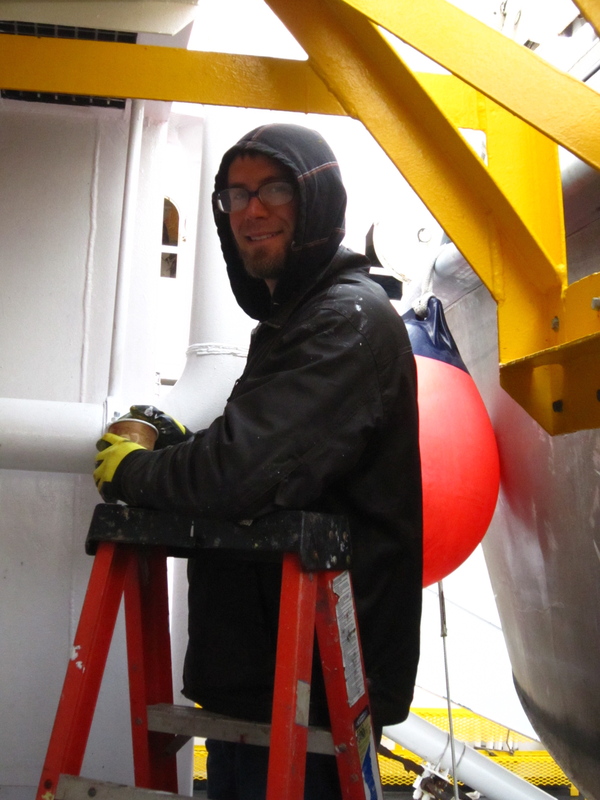 Tom repainting the exterior of ship. Ivan and Otis manning watch. Ensign Anthony on constant alert in the bridge. Let’s start with the cooking crew, because food is the best place to begin any conversation. . Dave, Nester, and Ace are the stewards for this journey and make incredibly tasty meals…even vegetarian ones for me and Shaina (Shaina is on an internship with NOAA while she attends College in Seattle). 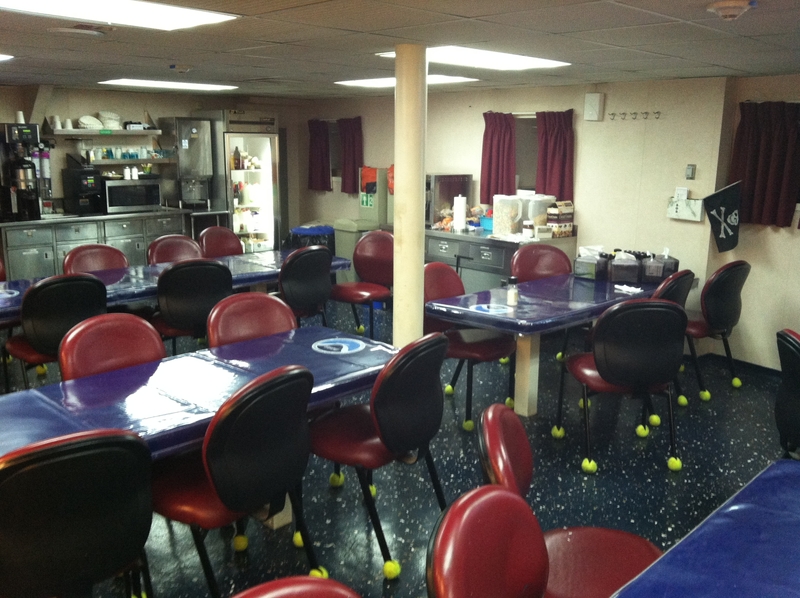 The kitchen on a ship is also called the “galley.” The deck department works by maintaining the ship. The tasks include chipping and painting (this is important because the sea water is constantly chemically eroding the surface of the ship) moving the launches in and out of the TJ, and keeping the ship balanced as a whole. 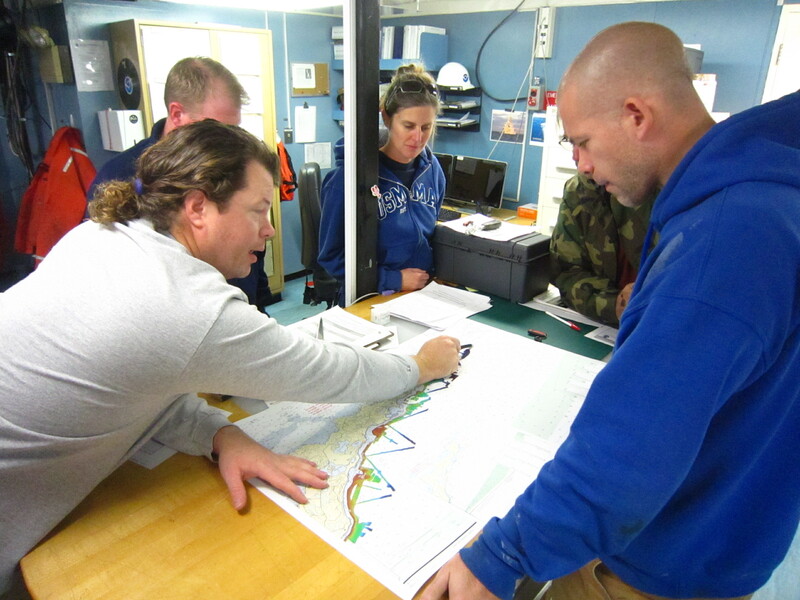 The “surveyors…” this team is quite large and essential to the ship because they conduct and perform all of the seafloor mapping (hydrographic surveying). The surveyors work around the clock and continually modernize old nautical charts to be used commercially and for recreation purposes. The mechanical engineers or “the heart of the ship.” The ME’s maintenance the engine, electricity, sewage, water, and keep all life lines to the ship running. There are multiple positions in the ME department:CME (Chief Mechanical Engineer), licensed engineers, JUE (junior unlicensed engineers) oilers, wipers, GVA (General Vessel Assistants). 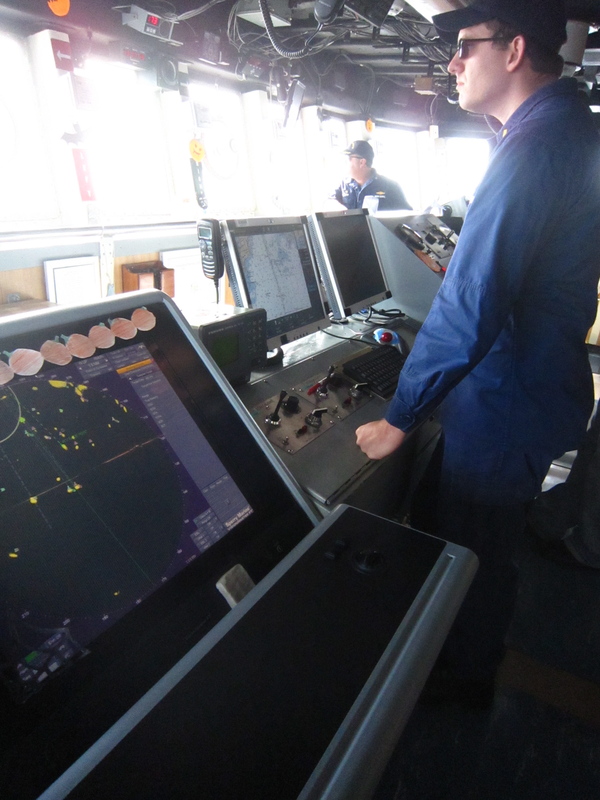 The officers are essentially the supervisors or parents of the ship. The officers “run” the ship in respect to giving directions, deciding where TJ will go, how fast she (all ships are referred to as she) should go, and pull the stops when things aren’t going well or need to be revised. 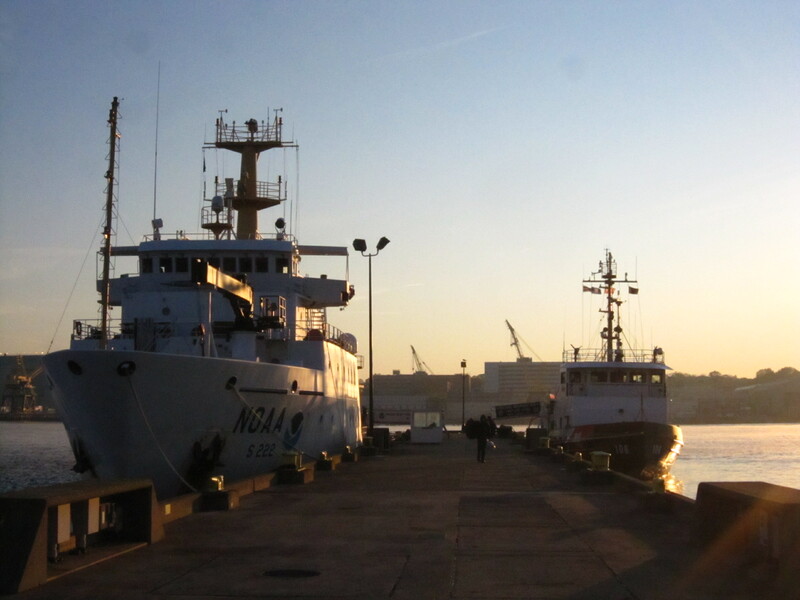 What is a scientific research vessel? 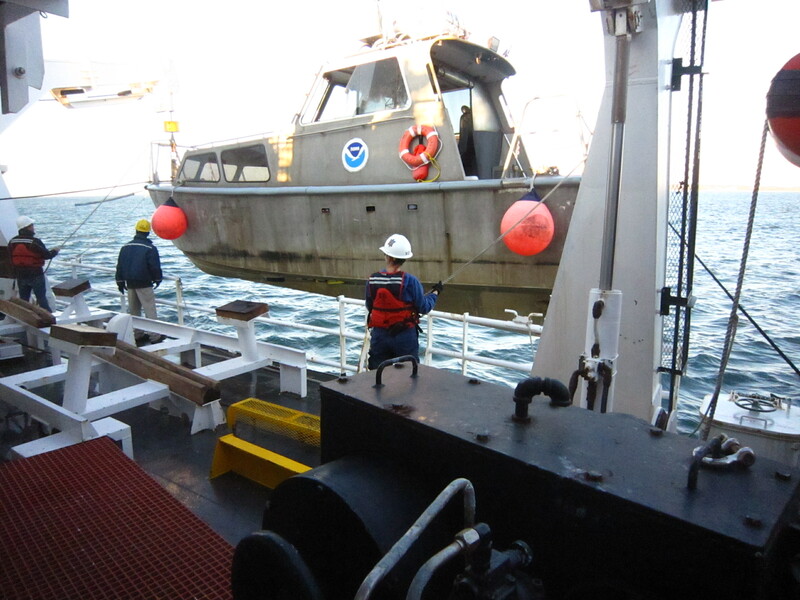 very exciting for the crew) or retrieving tidal data from instruments that lost power from our Nor’Easter last weekend (this is also exciting because it allows you to go onto land). TJ is 208ft long (just short of a block). Thomas Jefferson was the first President to realize the importance of surveying and safe navigation. Thomas Jefferson’s father, Peter was a land surveyor and was able to emphasize the importance of national surveying to his son. Thomas Jefferson commissioned the first surveying crew through the U.S. Government and as a result NOAA named their ship after him. A scientific research vessel basically means I am not on a cruise ship, and unfortunately there is no swimming pool, or drinks with little umbrellas. Instead it is like a business office on the water. Everybody is working all of the time. The only difference is that everyone eats and sleeps in the same place they work. Everybody works in 4 hour “watches.” If you are the 4-8 watch that means you work from 4am-8am and 4pm to 8pm everyday. Though this watch may not interest you, I love it because you are able to observe the sunrise and sunset each day. Other watches are from (8am-12pm and 8pm to 12am) and (12am-4am and 12pm-4pm). Imagine waking up at school, eating breakfast going to school for four hours (let’s say 4am-8am), taking a break and going back to school again for another 4 hours (4pm-8pm) and then going to sleep only to wake up the next morning to start anew. 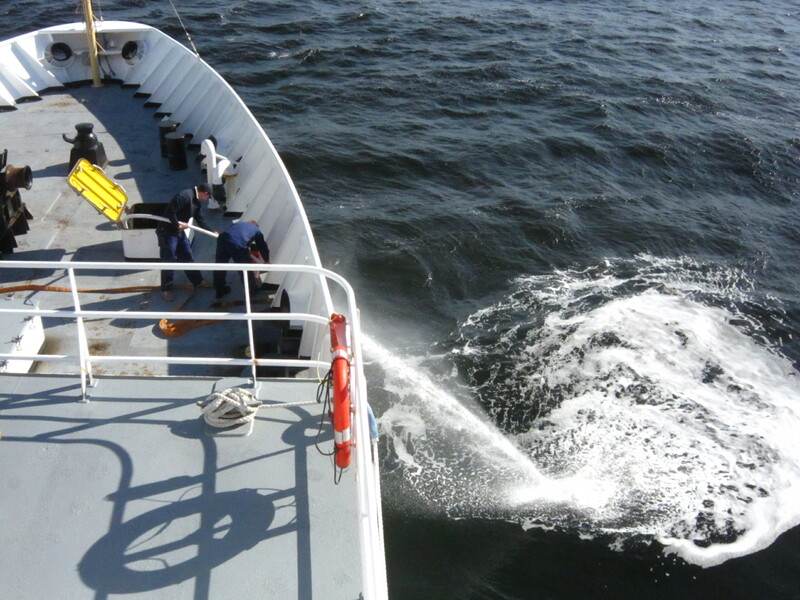 On a research vessel work is achieved and performed 24/7. I can wake up any hour and move throughout the ship to find the “new crew” that are on just beginning their new watch. OKAY, so the motion of the ocean (known to me as seasickness). The motion is kind of like being on the subway and not holding onto anything. If the subway moves back and forth on a ship that would be called the roll (like you rocking from right to left foot), if we were able to take a subway car and move it up and down that would be known as the heave, if you took the subway car and just tipped it up in the front (bow) and down in the front (bow) this would be known as the pitch and last but not least if you swung the subway car through turn after turn, right to left to right to left again this would be known as the yaw or side to side from port to starboard. Depending on the weather or if you are anchored (when the ship lets down a chain connected to a huge weight that is pushed into the sand) you can have ALL FOUR motions going at the same time. Last night while we were anchored offshore, the TJ was rock’n and roll’n and we had yaw, roll, heave, and pitch all while moving in a circle around the anchor…and I sadly was able to see my dinner twice in one evening! Do I need to go to college to work on a ship? Some of the positions require technical skills in surveying that can not be acquired without going to college, however the majority of the positions are trades that can be taught in a semester or year-long course. Many of the wage mariners aboard did not attend college, but instead attended a maritime school for one semester to one year depending on their rank. 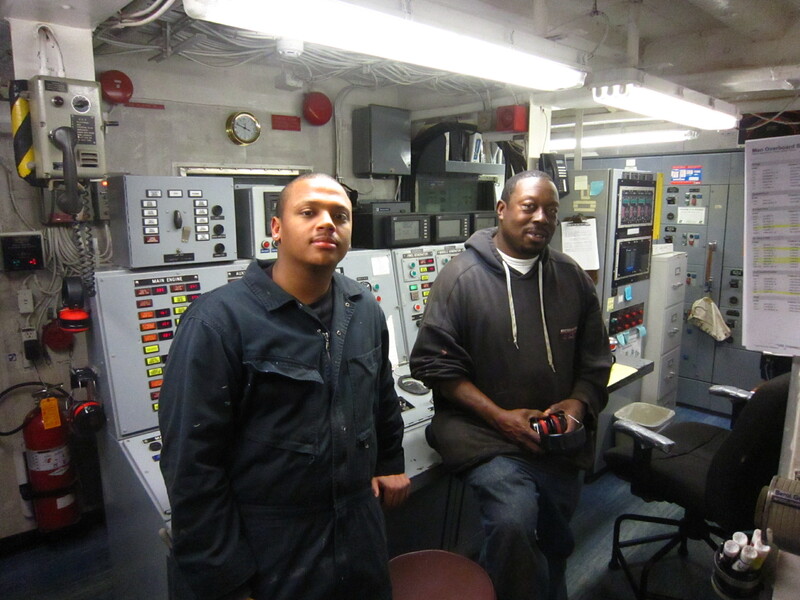 Many of the mechanical engineers were trained either in the Navy or at a trades school as well. There is a maritime school in NYC between Hunts Point and Queens (click on purple/blue mariners school). If you are interested in becoming a NOAA Corps Officer you will have to graduate from a four-year college/university with a major in any science discipline. The NOAA Corps Officer training program is also located in NYC. It is late at night and I am sitting on my bunk bed (top bunk) or crouching rather against the wall. I was given sheets and a pillow from NOAA to use for my trip, however I brought a small blanket my sister bought for me ages ago. 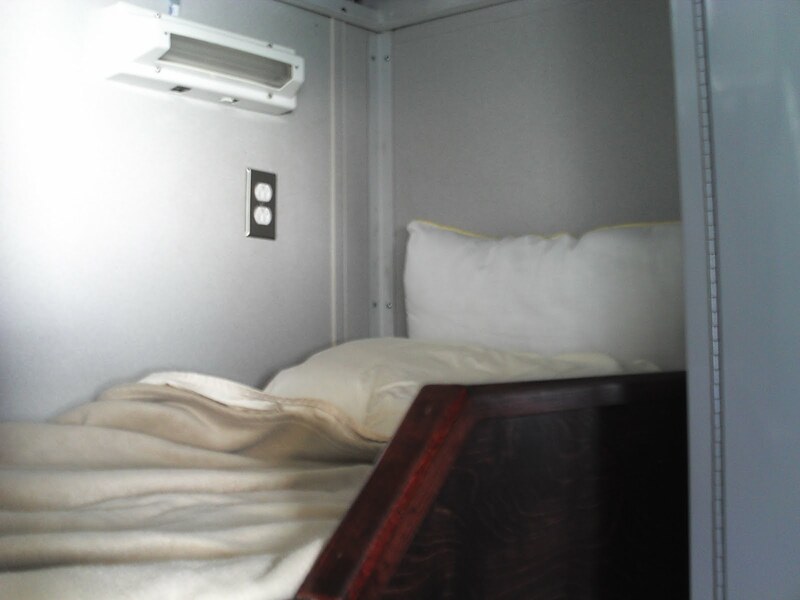 It is true, creature comforts bring smiles and happiness in the quietest moments. My curtains are swaying back and forth, my coat sways to the same rhythm and there is a small creak from my bathroom door trying to break free from its steal holds. 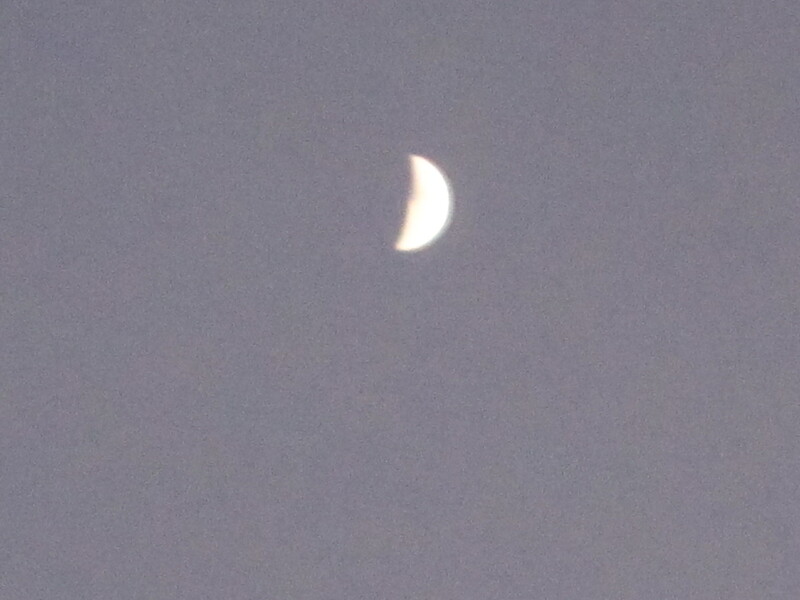 I just came from outside to breathe in one last crisp breath of air and peak at the first quarter moon shining on the Atlantic waters. It is amazing to look upwards or in any direction above the horizon and observe the celestial nighttime stars brilliantly held in the sky. 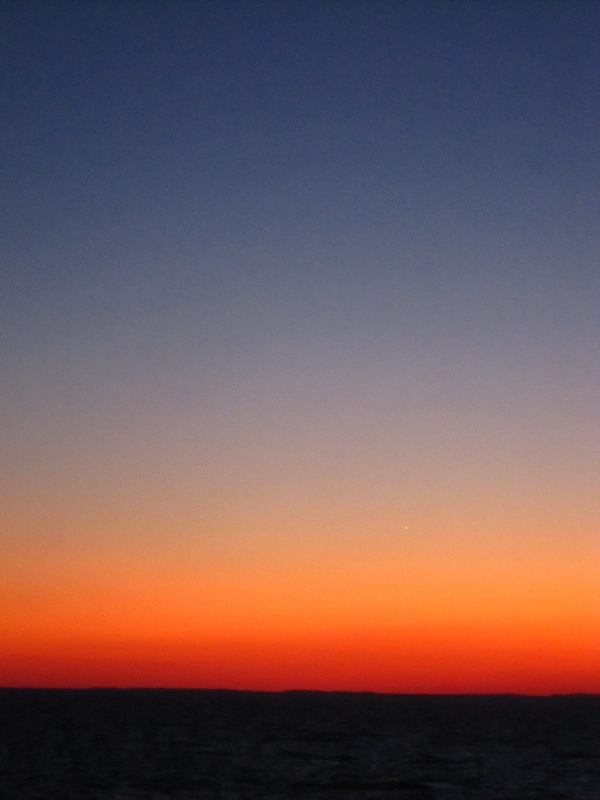 Tonight there are no skyscrapers or brownstones blocking my view. 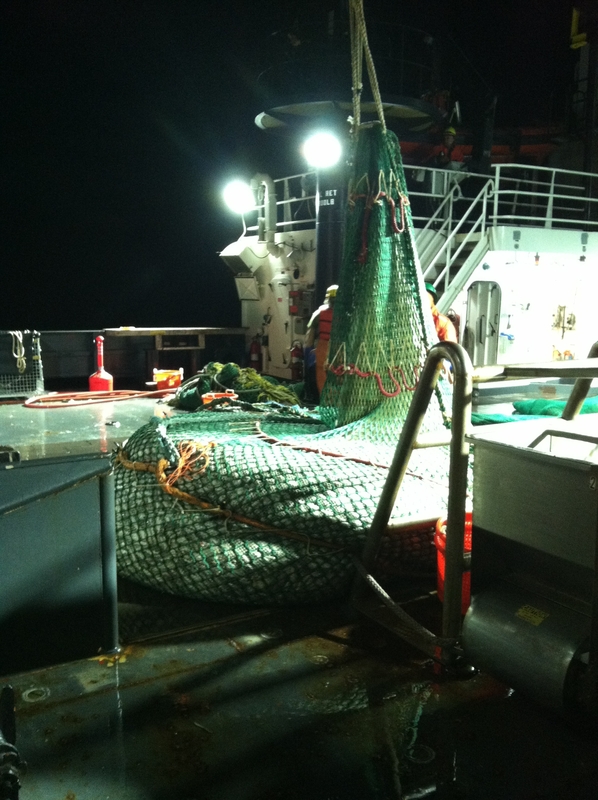 At night-time, when we anchor, I find the best position for me to be in, is laying down (or crouching). This seems the only time my food wants to fight gravity. We have had smooth sailing thus far (with exception to this evening). Today I was able to observe and listen to multiple meetings in the “plot room.” The plot room consists of all of NOAA’s hydrographic surveyors. 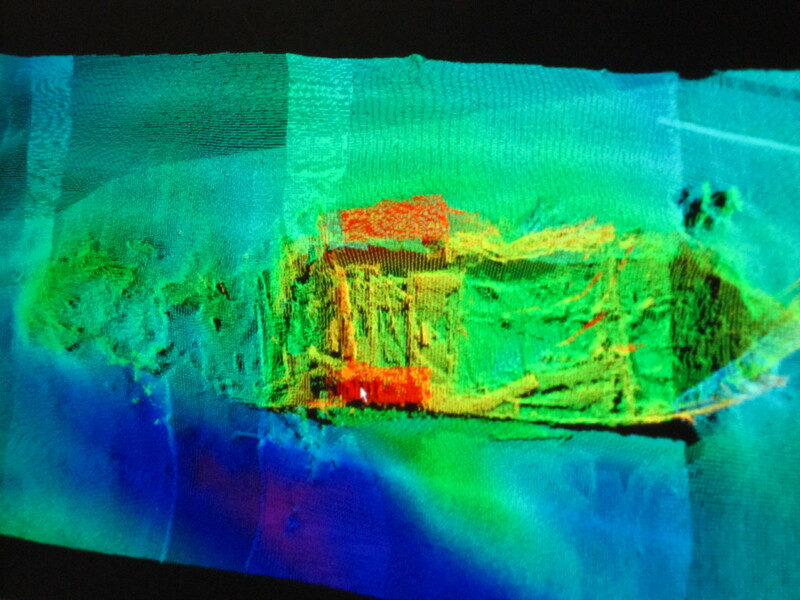 Some surveyors were plotting today’s scan while others scoured through old data looking for areas on the most recently made map that were missing information and identifying features on the maps such as rocks, piers, sunken ships, and other interesting features. While in the plot room I spent much of my time with James as he amazingly went through all of the many areas of surveying. 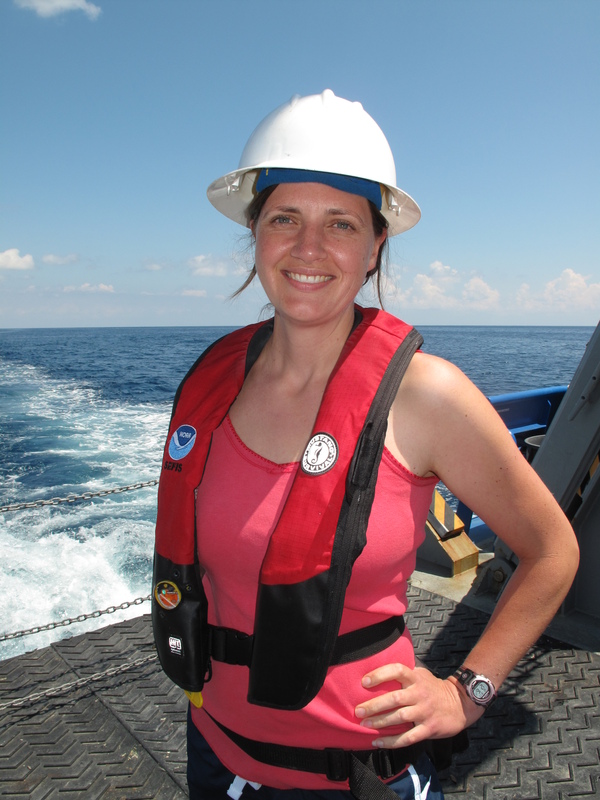 One of the major issues of mapping the seafloor is finding the “true depth” of the ocean. 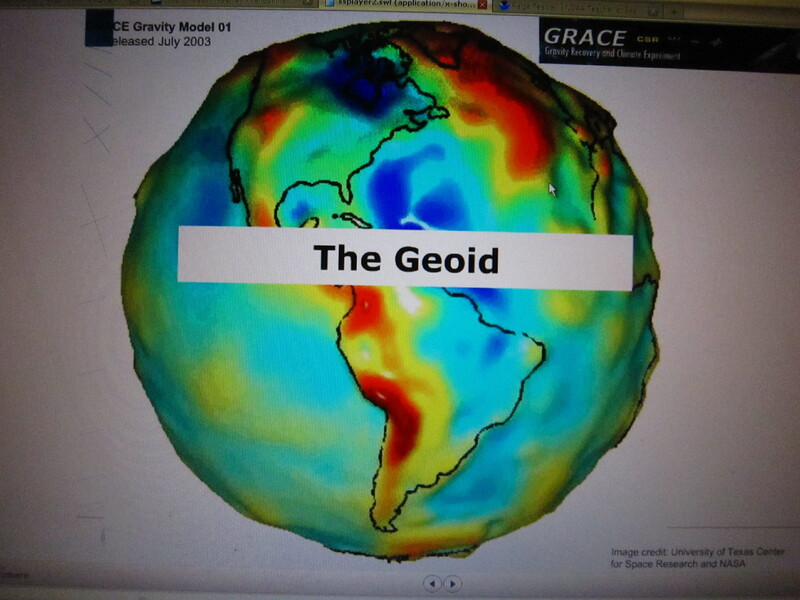 The ocean rises and falls each day due the gravitational effects from the moon (tides). NOAA and the hydrographic surveyors must take this tidal change into account in order to determine the “REAL” depth of the ocean. The surveyors must also account for the motions of ship lifting the beam when it is yawing, pitching, heaving, or rolling. Halfway through my lecture with James the Thomas Jefferson sounded its bell for a fire drill. In school during fire drills everybody vacates the building, however on a boat it is important for “All hands on deck.” This is when everyone comes to specific areas they have been assigned to on the deck (mine is the bridge or second level). 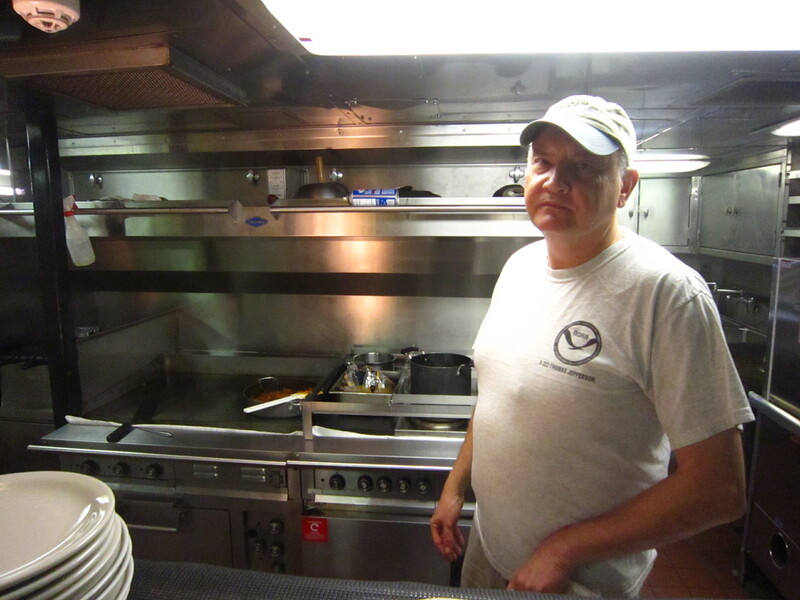 I met John and Kurt who are also visiting the Thomas Jefferson and we stood in the cold for about one hour as the deck crew pulled three different fire hoses from below and shot them into the water in order to test if they work. Initially this black brackish water shot out because the hoses had been sitting for so long, but eventually the hoses streamed clear salt water. Myself and Ivan in our "Gumby" suits. Upon going inside from the fire drill another bell rang loud and clear calling all persons to deck for a mandatory “man-over-board” drill. 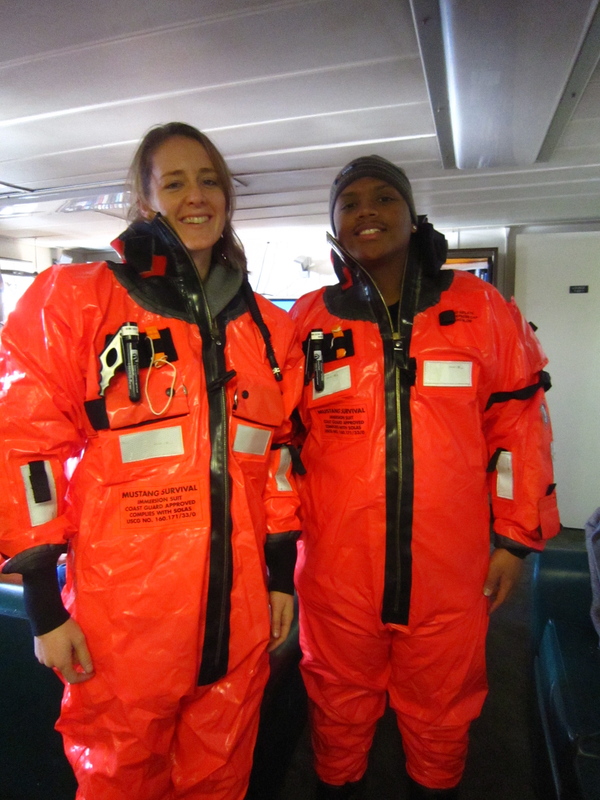 When there is a man/woman overboard everyone is to wear their pfd (personal flotation device or life vest) a warm hat, and bring along their immersion suit (also known as a gumby suit). I did not know we were supposed to wear a hat, so I looked like the only one trying to not follow orders…whoops. After the drill I had to try on my gumby suit with Ivan, and wished I could have worn it for Halloween. The “Gumby” suit floats and is incredibly warm, so if the boat goes down you do not necessarily need a life raft in order to stay warm and afloat. When I returned to the plot room James had found a ship wreck and was cleaning the image. 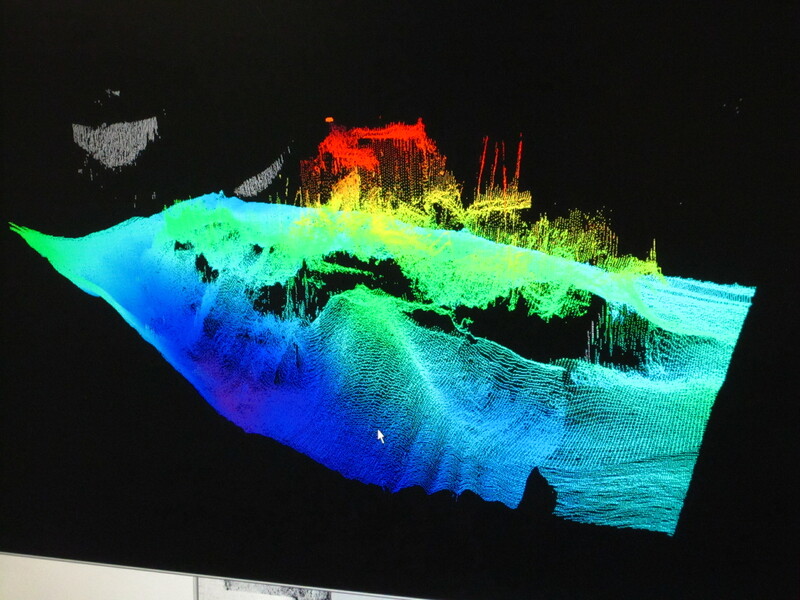 When the surveyors clean the images they remove fish, seaweed, or anything that takes away from the seafloor map. Ship Wreck from aerial view (viewed from above). Shipwreck profile (from the side). The grey stuff in back is a school of fish that will eventually be removed from the image. There is an exercise room on deck and I went running after dinner today. It was really hard to run because not only are you on a machine that is moving, but the machine is located on a boat that is moving. Even though I was able to run 3 miles, I felt like I had run 5 miles while trying to fight the motions of the ship. It felt like I was exercising while standing on a roller coaster that was moving. The Research Vessel Savannah departed around 1:00pm from its port at Skidaway Institute of Oceanography, 25 minutes outside Savannah, Georgia. There are 9 members of a science team including me, and 6 crew members, for a total of 15 people onboard. In the morning, we loaded the research equipment and supplies (8 traps, ice bins, bait, buckets, research cameras that we mount on the traps, water, lots of sunscreen, etc.). 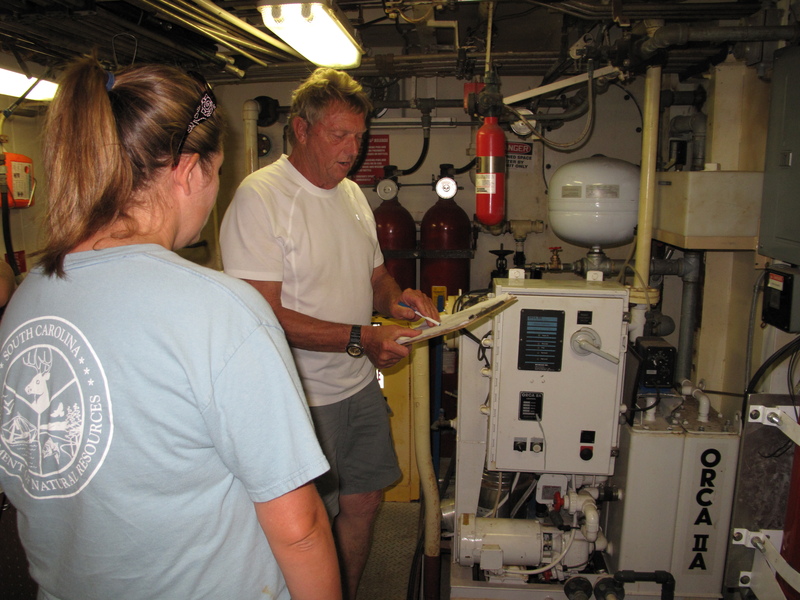 Richard Huguley, ship engineer, led many of us on a tour of the engine room before it was roaring and heated up. A few fascinating facts about the engine room are below! Richard tours us through the engine room before it's too hot! We set out of port on the Skidaway River, to the Wilmington River, and out to Wassaw Sound, an estuary where fresh water meets its fate, the Atlantic Ocean. Just as the boat was beginning to rock from the rougher seas of the open ocean, Michael Richter, the first mate and safety officer of the ship, called a safety meeting, which included what to do in case of emergencies such as a fire onboard, man overboard, abandon ship, as well as general safety rules to keep us safe on a daily basis (e.g. how to open doors so you don’t break a finger, gear to wear during work on the deck). Someone had to model how to get into the “Gumby suit”, a survival wetsuit that will protect from hypothermia, jellies, and sharks should we have to abandon ship immediately. Well of course I had to be the one to try out the Gumby suit! 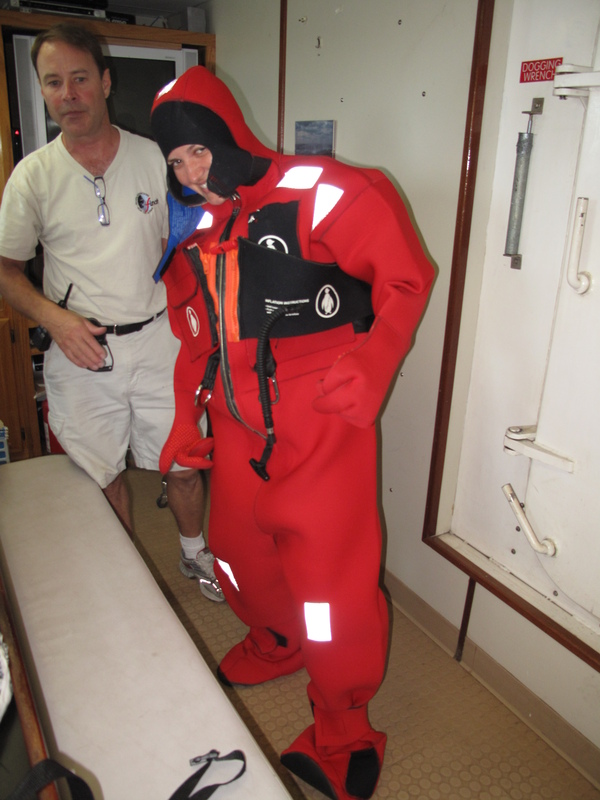 In my survival suit, the "Gumby suit"
Finally, we were told a muster drill would occur soon. 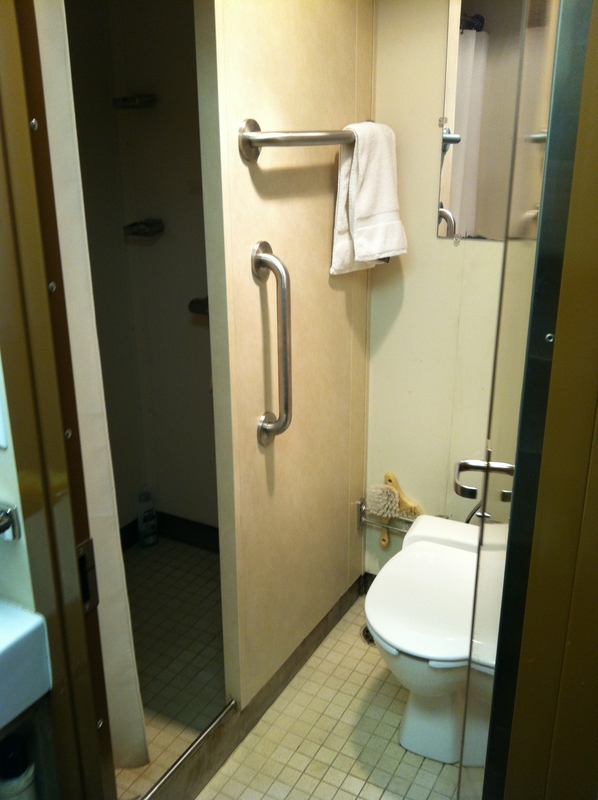 Later on, just as I was exiting the head (toilet), the general alarm sounded and a “man overboard” drill was conducted. See below to learn how to respond to a man overboard emergency. The focus of this NOAA Fisheries cruise is to survey the population of commercially-important species to inform stock assessments. Christina Schobernd explained the mission another way: “We study how many fish there are, where they are, and get information so we can tell fisheries how many fish to catch so that the fish populations are sustained (or, so that they don’t run out of fish).” We will be taking samples of fish that swim into our traps, observing and recording their abundance (how many) and location. Some of the fish will be taken into the lab for further study. It is critically important to monitor the populations of these fish to avoid over-fishing of these waters. 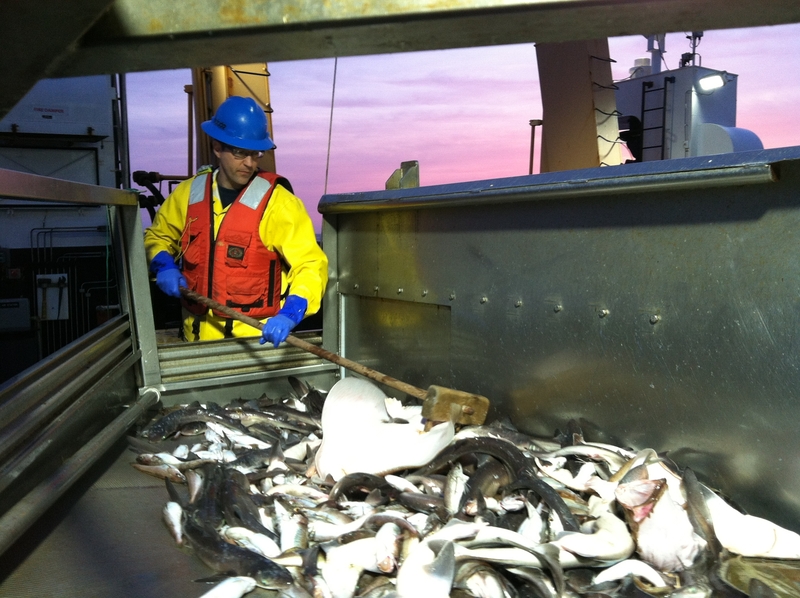 Each day out at sea starting 8/17 to 8/25, we will drop 6 traps per round of sampling, and as we process the fish we catch, we’ll drop another round. We do this for a total of 4 rounds per day, or a total of 24 samples per day, if all goes as planned. I am working the noon-midnight shift with a team of three other scientists: David Berrane, Katie Rowe, and Stephen Long. I love the life of living in a boat! Everything is compact, space is limited, and efficiency is the key. 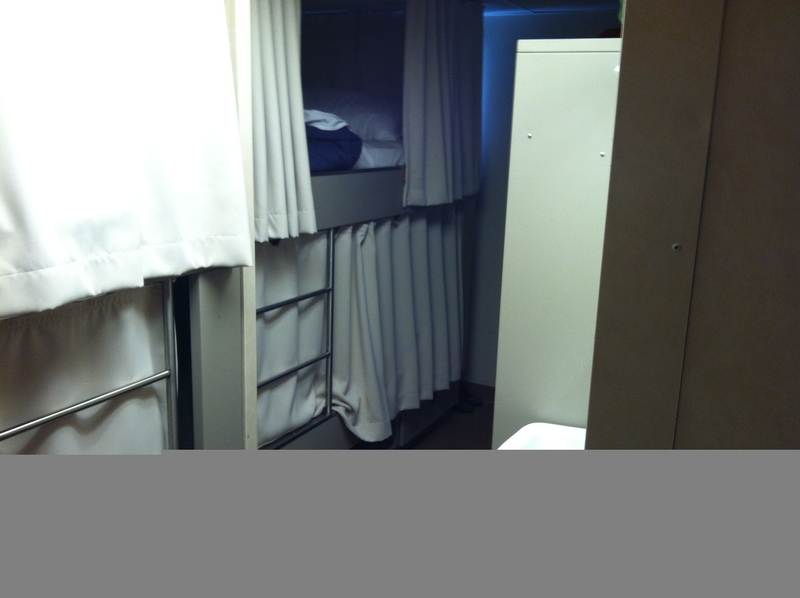 The ship is actually far more outfitted than I expected: with a light and power plug at my bedside, air conditioning in my stateroom, running (not pumping) water in the head, a state-of-the-art-for-boats kitchen with walk-in fridge and hooded stove! It took us many hours to travel to where we were to begin dropping the traps so, besides preparations, we did not have a lot of work to do the first day. 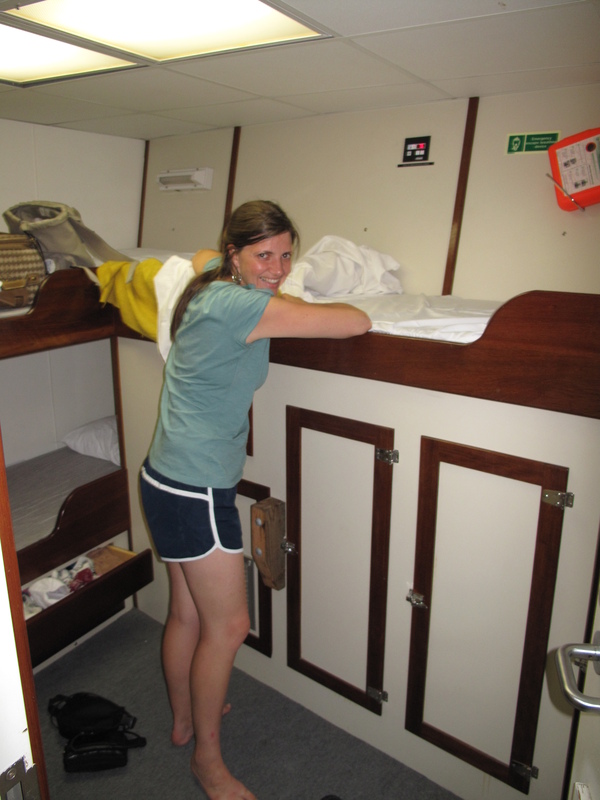 This was advantageous to give me a chance to transition into life at sea, especially with the ship rocking in a “wash-machine” like motion, I spent the first afternoon and evening getting sick, or as we like to say out here at sea, more elegantly: “Getting my sea legs”. Read more below about why seasickness is so common. Although it is very unpleasant to get seasick, it was comforting to know many of us were in the same boat. Many of those who travel at sea on a frequent basis were sick last night too. This morning on our second day out, I am feeling fully recovered from seasickness, and I have spent the morning eating delicious banana pecan waffles and enjoying conversations with fellow scientists and crew. The sea is very calm this morning too so that helps. In less than an hour from now, I’ll be on my first 12-hour shift! I am learning so much from this experience and am embracing every moment! 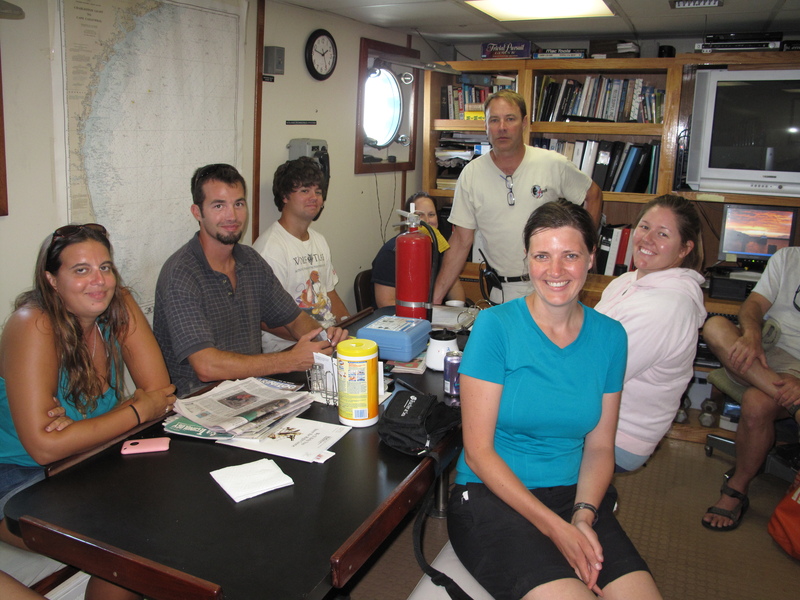 Some of the scientists and crew I am working with! Fact #1: We use laser light to detect temperatures of instruments in the engine room to make sure they are not overheating and all running smoothly. Fact #2: How can we keep the water that runs our air-conditioning cool? 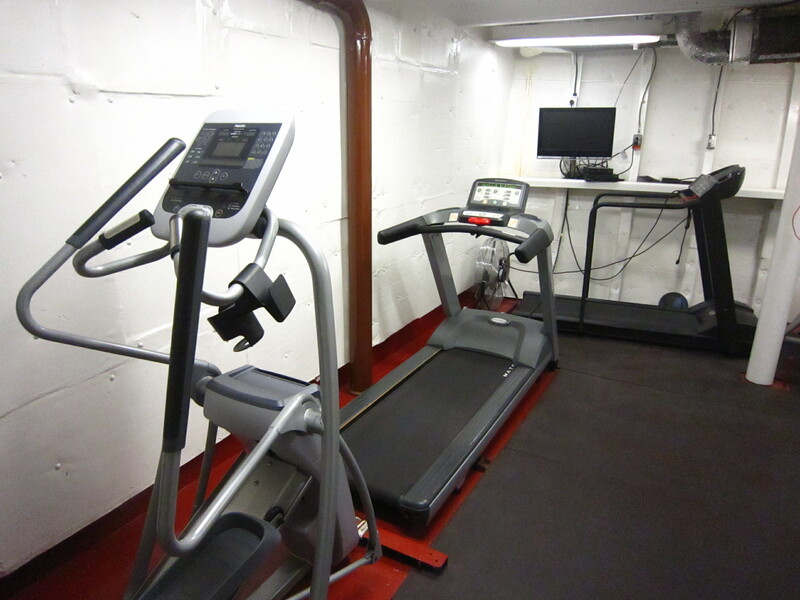 To run the ship’s air conditioners, it takes 1.5 gallons of fresh water per minute. With 25 air-conditioning units on board, that is a lot of water! With a limited amount of weight and space available on ship, we couldn’t possibly keep enough new fresh water to ensure we have cool water entering the system. So how do we do it? We have a closed system, so the same water cycles through over and over again, and we use a heat exchanger mechanism to keep it cool as it starts a new cycle. 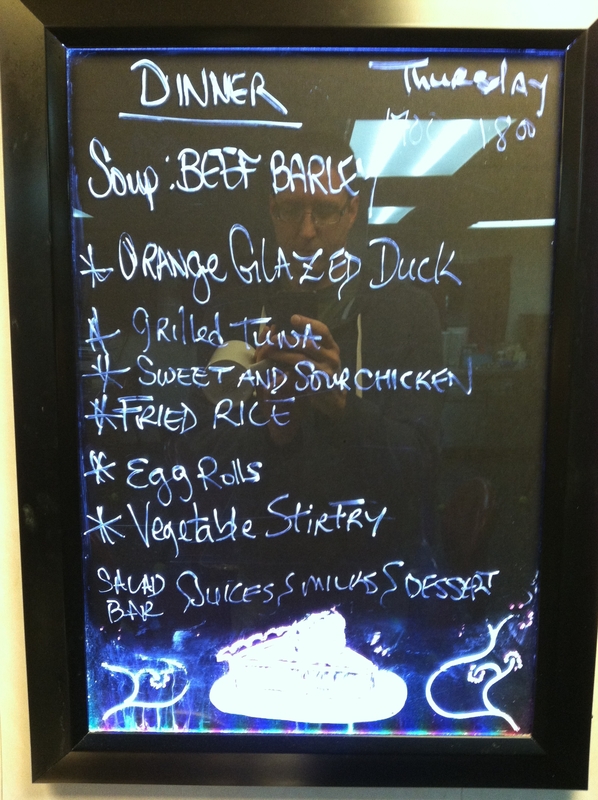 What could we use that is cool that we have an unlimited supply of? Salt water! The heated fresh water runs in the bottom of the heat exchanger machine, and comes out the top. Cool salt water runs in a countercurrent direction: in the top and out the bottom. As the cool salt water passes by the heated fresh water, the heat transfers from the fresh water to the salt water, cooling the fresh water, heating the salt water before it is disposed of back into the ocean. Because the salt water is so abundant, it can run in an open system, where it is continuously fed anew into the pipes as it is continuously running out of pipes at the other end. Call out for assistance and throw a life ring buoy into the water (best if it has a strobe light). Pass the word to the Bridge by any means possible. Wait about one minute and throw a second life ring buoy into the water to create a visual range to aid in the search effort. Keep the victim under surveillance if at all possible, but do not delay passing the word to the Bridge. Until proven otherwise, when a crewmember is unaccounted for, it will be presumed that the individual has been lost overboard. The time of the casualty will be unknown. The ship’s navigation record will be crucial for search planning, as will the hourly weather observations entered into the Weather Log. 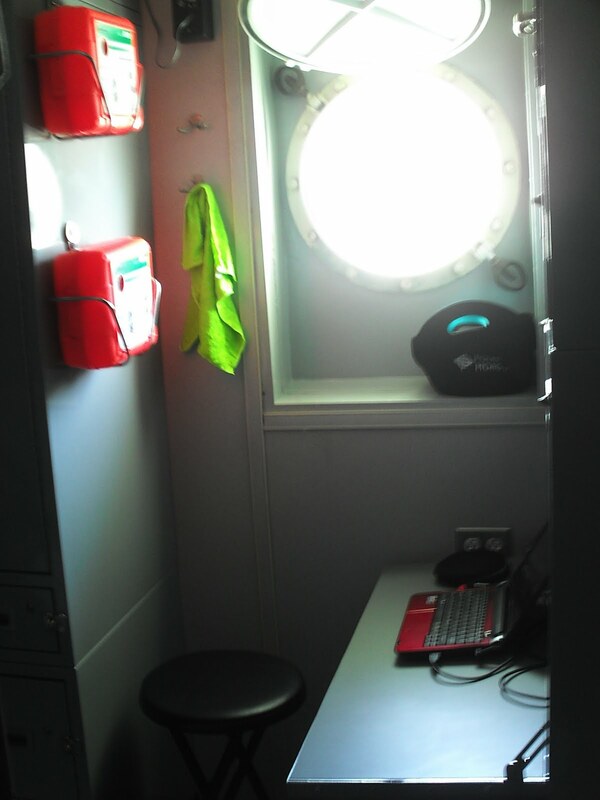 Most people feel some level of illness or discomfort when they first go to sea. Seasickness is a result of a conflict in the inner ear (where the human balance mechanism resides) caused by the erratic motion of the ship through water. Inside the cabin of a rocking boat, for example, the inner ear detects changes in linear and angular acceleration as the body moves with the boat. But since the cabin moves with the passenger, the eyes register a relatively stable scene. Agitated by this perceptual incongruity, the brain responds with a cascade of stress-related hormones that can ultimately lead to nausea and vomiting. Its effect can be magnified by strong smells (like diesel fumes or fish). It usually occurs in the first 12-24 hours after sailing, and dissipates when the body becomes acclimated to the ship’s motion. 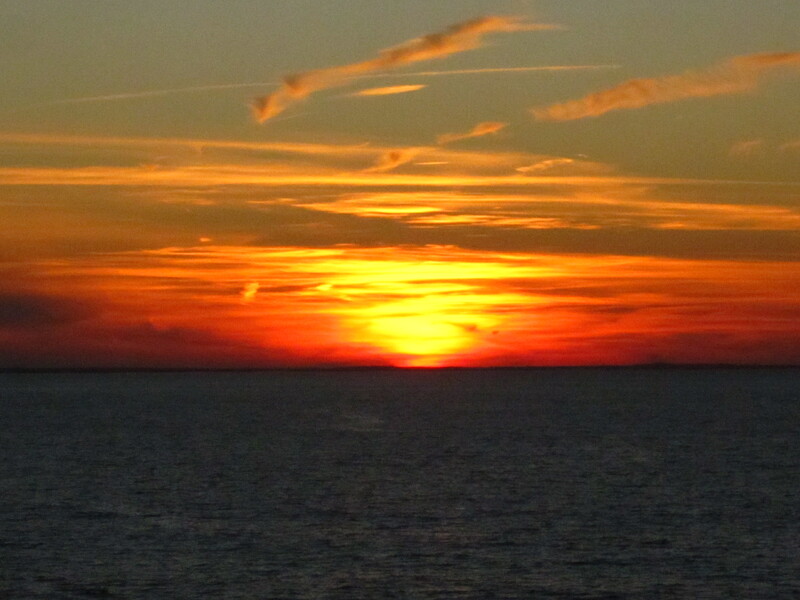 Rarely does anyone stay ill beyond the first couple days at sea, regardless of sea state. Don’t be embarrassed or discouraged! If you get sick, chances are that others are sick too! 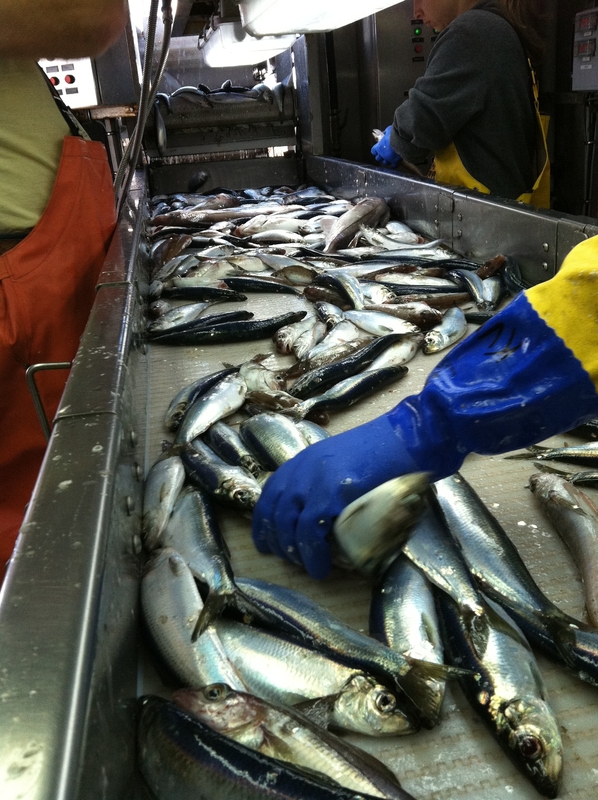 No one—fishermen, ship’s officers, scientists—is immune to seasickness. Tip 1: Dehydration comes quick. Drink lots of water. I met my roommate, Claudia, this morning. She was on this cruise last year. Basically we catch, tag and release sharks and any other fish we may catch. I walked into town to pick up things I forgot. Ashley, Guy and I run into town for our last meal on land, a Subway. During the excitement of casting off, I’m informed that I have the night shift. Me, the goddess of the morning. they must be kidding. As we reach open water the sea is really rough. At dinner I’m advised to go to bed right after dinner and get up at 2:00am to acclimate my body to the night shift. So right after (6:30pm) dinner I head off to bed. My roommate is already there, she is green. She tells me she doesn’t feel well and needs to lie down. There is no way I can fall asleep. I lie there, waiting to fall asleep. Finally, I’ve been lying there so long, it most be time to get up. I look at my watch… its only 9:00. I finally fall asleep.